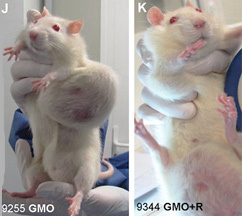 Large cancerous tumors on white mice fed NK603 Roundup-tolerant genetically modified corn or given water containing Roundup at levels permitted in drinking water. This is the first medical study to examine long-term effects of Monsanto's Roundup herbicide and NK603 Roundup-resistant GMO corn created by Monsanto. 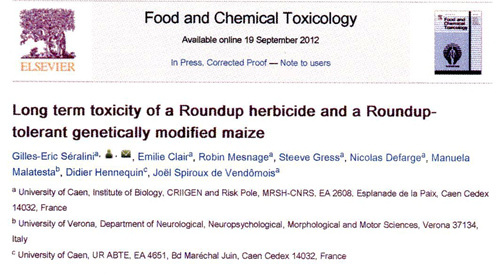 CRIIGEN research led by Prof. Gilles-Eric Seralini published September 19, 2012, in Food and Chemical Toxicology. Food and Chemical Toxicology, September 19, 2012. Reprint October 13, 2013 - September 27, 2012 Oakland, California - According to the U. S. Department of Agriculture's Economic Research Service, in 2011 the percent of corn crops in America that contain some form of genetic engineering is 96% . Most of that genetic engineering is Monsanto's Roundup-resistant corn in which the Roundup NK603 herbicide is built into the plant.